What, exactly, do you know about your body? Do you know how your immune system works? Or what your pancreas does? Or the myriad -- and often simple -- ways you can improve the way your body functions? 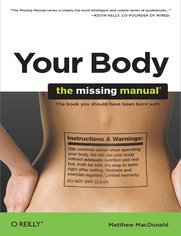 Rather than dumbed-down self-help or dense medical text, Your Body: The Missing Manual is entertaining and packed with information you can use. It's a book that may well change your life.